Bixente Lizarazu may not be a name particularly familiar with our American readers. But, despite his short stature, he’s kind of a big deal. This is indeed true. But, now Lizarazu is also a great player in an entirely different sport: Brazilian jiu jitsu. The Frenchman of Basque descent helped his country with the 1998 FIFA World Cup in his home country. 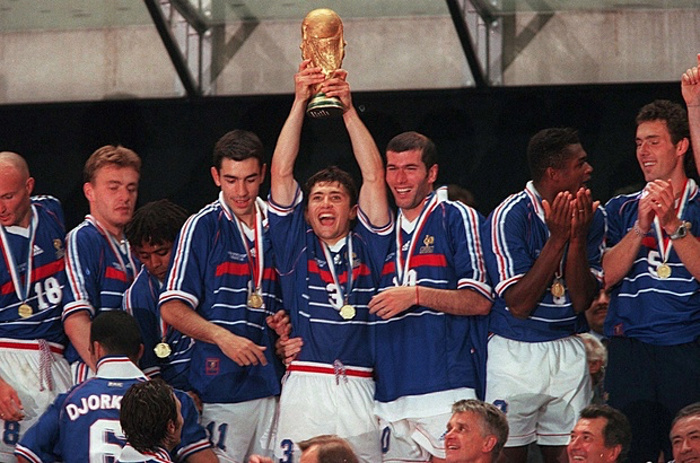 The evocative memories of Lizarazu and his teammates parading the World Cup silverware down the Champs Elysees will live long in the memory of the French as they handily beat Brazil in the final in Paris. This is before they repeated their success by winning the 2000 Euro Championships with Lizarazu in tow. Lizarazu also won the Champions League with German giants Bayern Munich in 2001: another feat enjoyed by a select few of the world’s top footballers. In fact, Lizarazu is one of 39 players in the history of soccer to have ever won at least one domestic championship (again with Bayern on six different occasions), a continental title with his club, a continental win with his country and the World Cup. Martial arts, MMA in particular, have enjoyed some tenuous link with football in the past, what with Kenny Florian being a good collegiate player and Ulysses Gomez’s brother Herculez representing the USA in the 2010 World Cup. However, after hanging his boots up in 2006, Lizarazu was trying to find new ways to maintain his fitness. He was already a renowned surfer. He had even taken up a new discipline in the Skeleton with hopes of competing at the 2010 Vancouver Winter Olympics. But, Brazilian jiu jitsu really grasped his attention. Training under French black belt Yannick Beven, Lizarazu took to the mats like he did on the football pitch—with consummate ease. They say it’s hard for former top-level professional athletes to dispose of their competitive edge, but Bixente harnessed that drive in the confines of the gym. He only started training in 2008. But, the 5 foot 7 Frenchman competed in the European Brazilian Jiu Jitsu Open in Lisbon, Portugal in 2009. In what was the first competition he never imagined having a chance of winning, he was victorious the blue belt senior tournament for lightweights and became European champion. Spurred on by his success, Lizarazu went on to compete again at the tournament a year later—this time at purple belt. He finished in third place. Lizarazu has said he will stick to Brazilian Jiu-Jitsu among his other pursuits, which include the aforementioned disciplines of surfing, the skeleton mixed with his journalistic work for the French football media. Though, he has mentioned he would be keen to coach in a footballing capacity and bring some of the mentality BJJ has provided with him.